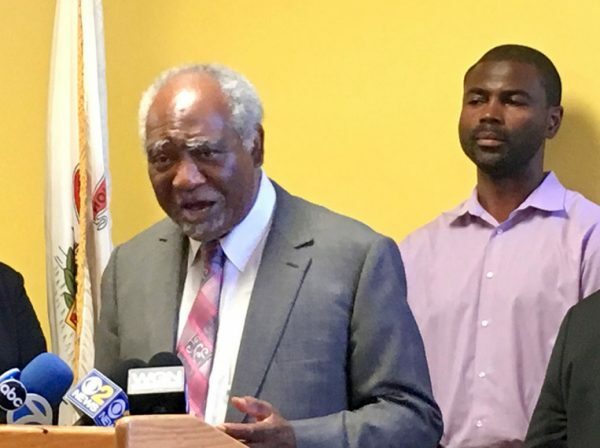 Congressman Danny Davis and state Rep. La Shawn Ford have organized a conference to improve the state of African-American men. A two-day conference focusing on improving the lives of black men and boys takes place next week at UIC Forum. Slated for Sept. 8-9, the “State of the African American Male (SAAM)” conference will feature a resource fair and workshops on issues including violence, jobs and poverty. This past spring lawmakers, residents and community members met at a local Austin church to figure out how to address the problems facing black men. Those problems are well-documented, said U.S. Rep. Danny Davis, one of the main sponsors of the conference. “What we really know is that poverty is at the core of many of the issues and much of the problem. What is at that you can do to alter the impact of poverty?” Davis said. Poverty, he noted, is among the most crippling issues for black males. Nationally, some 55 percent of black men live below the poverty level; and in Chicago, it’s 27 percent, nearly double the city’s poverty rate, according to federal and city data Davis cites. The goal of next week’s conference is to leave the event with some “concrete strategies” that can be implemented at the neighborhood level, Davis said. The black male prison population is a result of many long-term, historical problems, the congressman noted. Black men, for instance, make up the largest group of inmates in state prisons, some 38 percent, compared to white men at 35 percent – black men are also five times more likely to be incarcerated than whites, according to the Federal Bureau of Prisons. As for jobs, the unemployment rate for black men nationally is about 8 percent, nearly double the national average, according to U.S. Department of Labor. Davis and other conference supporters insist this latest effort to help black men can be different than what’s been done in the past. Davis talks of a strategic plan for black men. Some solutions, though not new, are still needed on a broader level. Some goals are already being set for his 7th Congressional District, Davis said, including creating more youth programs, such as Boy Scouts and neighborhood after-school programs. “They already exist, but there’s not enough of them,” Davis, who’s co-sponsoring next week’s conference with Sankofa Safe Child Initiative. Another goal is creating a “black male alliance” linking boys with mentors. On the economic side, federal and state legislation on creating more jobs and grants is part of the strategy. But keeping folk fired up and motivated after the conference will be a challenge, noted Davis, and state Rep. La Shawn Ford, who’s focusing on ex-offender reentry with the SAAM initiative. Ford, who chairs the Illinois General Assembly’s Financial Institutions Committee, said he hopes the business community will become more involved in helping black men. Another way to keep the initiative moving forward is for black people to take ownership of it, Ford added.